Dot left a comment on last night’s post asking what happened to the photos. Well we were tired so they just didn’t happen yesterday. But now the batteries have recharged. 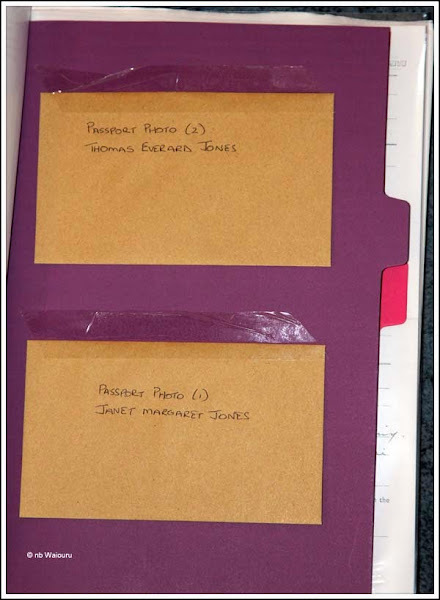 These are two photos of the folder I made to hold the visa application documents. 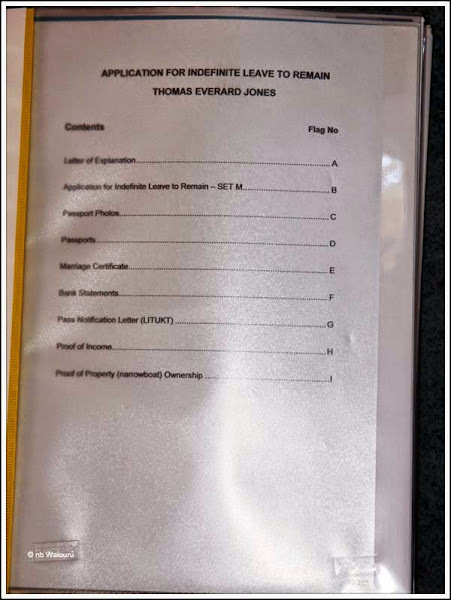 The nice plastic folder with the front index page. Everything nicely partitioned to make it easy for the reader to navigate around the documents at tick-over! Pity it was binned by the Checking Service! The Settlement Checking Service is located in the Manchester Register Office. It’s the office where locals go to arrange for births, deaths and marriage certificates, etc. The waiting area has half a dozen tables and chairs which I presume have been provided for people to use to complete their application forms. 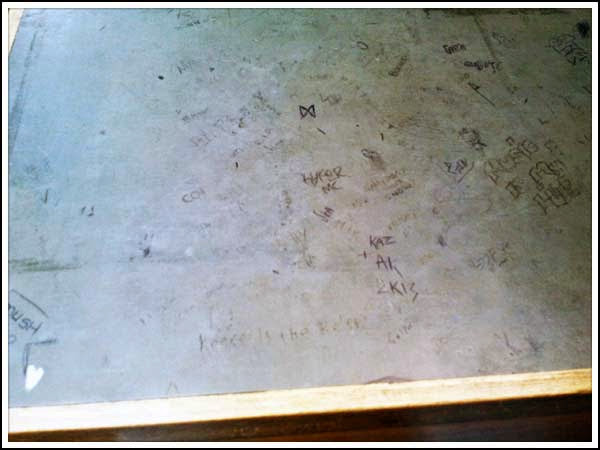 What astonished me was the amount of graffiti on the table tops. The condition of the table tops looked exactly like the desks I sat at when at secondary school. Actually I was very surprised to see all the furniture in this state. This is being done by adults! Moreover I’m even more surprised the council hasn’t replaced or repaired the tables. Leaving graffiti only encourages more of it. All this racing around the inner Manchester CBD didn’t give us much time for sight-seeing. But then we knew we’d be back one day by canal and with time to have a good look around. I managed to take a couple of quick snaps on the photo camera. 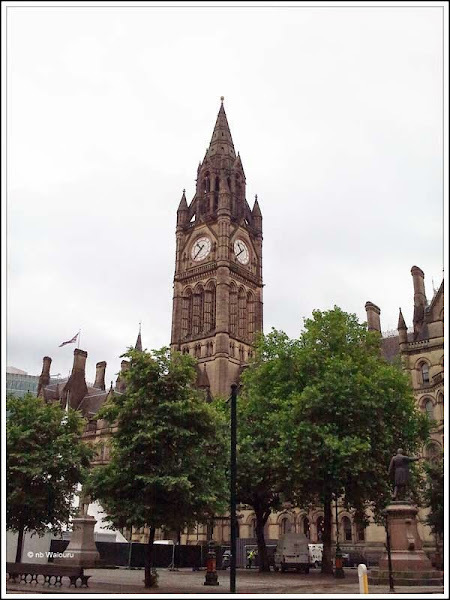 The Manchester Register Office is opposite the Town Hall across Albert Square. There had been a Jazz Festival in the square at the end of July which why there were large white tents. In front on the Town Hall was the statue in the photo above. It was a male and my guess is it’s a statue of Albert, Queen Victoria’s husband. If you really want to ingratiate yourself to your monarch then build a statue to her much loved and departed husband! A quick search in Google confirmed my assumption and this is what Wikipedia has regarding the statue. The square's creation arose out of a project by Manchester Corporation's Monuments Committee to erect a memorial to Prince Albert who had died of typhoid in 1861. After initial proposals to create a memorial library, museum or botanical gardens, the committee decided to erect a statue in a decorated canopy. It was originally planned to place the monument in front of the Royal Infirmary building at Piccadilly, between the statues of Wellington and Peel. However it was felt that its ornate Gothic design was not in keeping with the neoclassical infirmary. In 1863, land was offered by the Corporation which was cleared to make way for a public space. 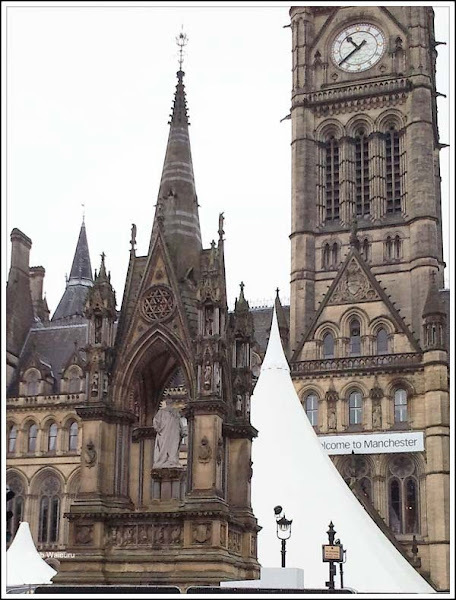 The project won much public support; the Manchester Bricklayers' Protection Society donated 50,000 bricks towards the monument's construction, "as an expression of sympathy towards our beloved Queen". When construction problems arose (the site was found to be riddled with drains and culverts) and the bricks were used up on the foundations alone, a public subscription was launched in 1865 and a further £6,249 was raised, in spite of the hardships of the Cotton Famine. Clearing the site began in 1864, and required the demolition of over 100 buildings, including the Engraver's Arms pub, a coffee roasting works, a smithy, a coal yard and various warehouses. The project was encouraged by the visit of the Prince and Princess of Wales to open the Albert Monument in 1869. Ref Registry Office. I depends how you define adults. Probably a good percentage are under 20 registering the births of their kid and if they are like the ones around here half of them will be lacking education. It only takes a small percentage to make a place look like that. Came past you (very) early this morning, no sign of life (what a surprise)!! Hope the PH was up to standard ? Came past at 06.05 ! Apologies to Jan. I assume this is to prevent them hiding in the corner?